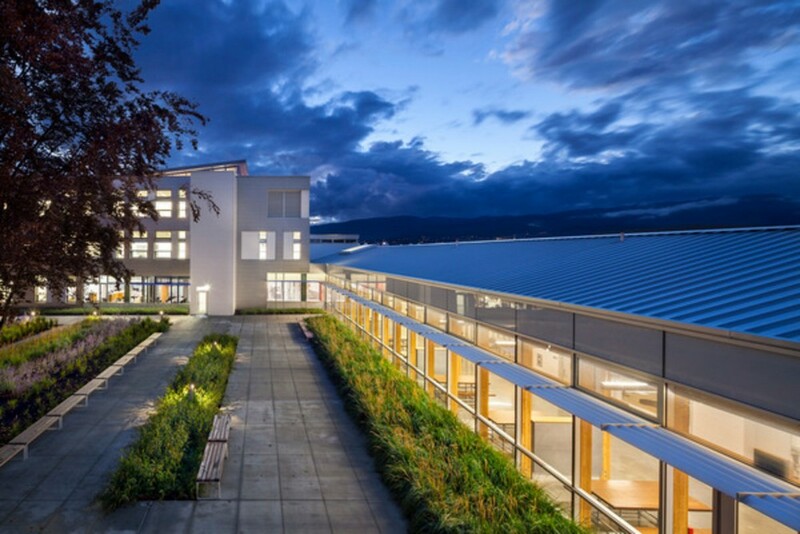 The primary objective of the Okanagan College Trades Renewal and Expansion project was to enlarge and unify disparate elements of the Trades training program on the Kelowna, BC campus and to provide an exemplar of highly sustainable building design for students and future generations of trades workers. The project comprises two distinct but integrated components: the renovation of 45,000-square-feet of existing Trades Workshop and the construction of a 60,000-square-foot addition. The new space accommodates classrooms, group offices, labs, trade shops, a café, as well as student social and study space for the campus as a whole. A main component to the project was its ambitious sustainable design targets. They include achieving Living Building Challenge petal certification including Net Zero Energy, and LEED Platinum for the new addition, and LEED for Existing Buildings Certification (LEED EB:O&M) for the renovation. That a trades facility with its high energy-use requirements to power tools and equipment can strive for this level of energy self-sufficiency sends an important message that a sustainable future is not only attainable but is possible now. To enlarge and renovate this trades school and make it an exemplar of sustainable design and to provide better integration of program areas as well as connection with the city. The project is focused on extreme energy conservation and the end goal of Net Zero was a priority in every decision. Current models identify energy consumption of 74kWh/m2/year. 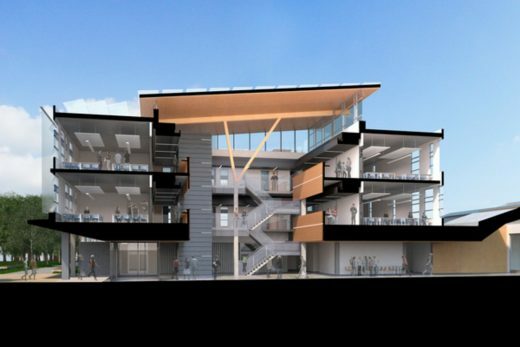 This will be offset by an integrated photovoltaic array to achieve 0.0kWh/m2/year, which could conceivably be the lowest number seen for an academic classroom building in Canada. The construction technology in the building was shaped by the net-zero target and it was critical that all systems were designed to work in unison. An integrated approach to structural systems, thermal systems and cladding systems was necessary to achieve this ambitious target. Four systems work closely together: a concrete structure integrating a low temperature hydronic heating and cooling system, a highly insulated exterior wall system, carefully controlled glazing ratios, and solar heat gain control. 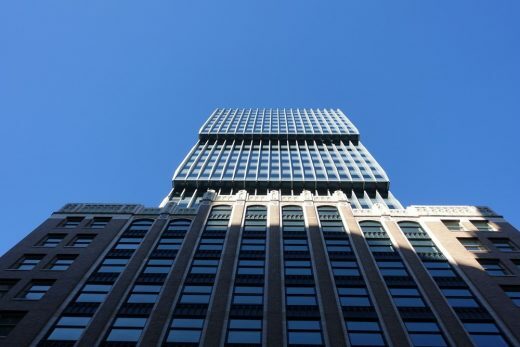 It was crucial to achieve as close to 100 percent solar shading as possible to avoid the need to supplement the low temperature system. The new addition, located on the south side of the existing Trades Workshop building, is a three-storey concrete structure, with a large atrium roof comprised of 130mm-thick fluted glue laminated timber (GLT) panels with acoustic groves on glulam beams and V-columns. The V-shaped glulam columns are used to keep the supports slender by transferring loads directly to the offset concrete landing below. 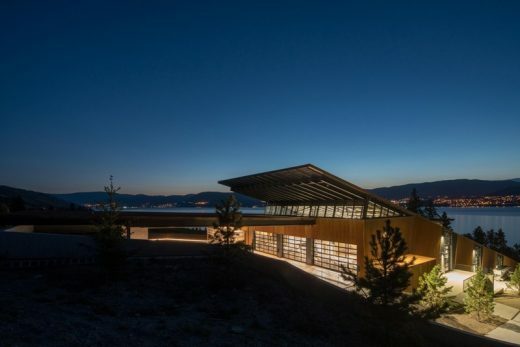 They also elegantly support the sloped timber roof, which is canted towards the south to create an optimal location for solar panels, fastened directly to the standing seam roof. 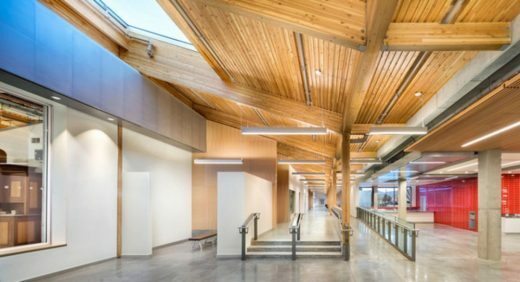 The slope also maximizes daylighting from the north, which brings abundant diffuse light into the three-storey central atrium space and highlights the warmth of the wood soffit. To achieve near net zero energy required a comprehensive approach to sustainable design solutions. 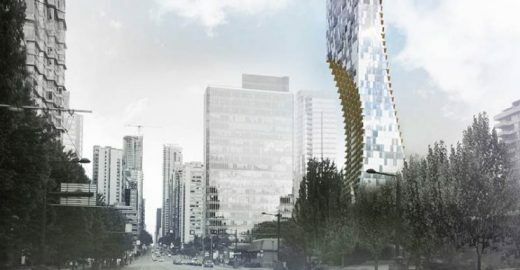 The new addition is a centralizing feature that connects to five different existing buildings. Consequently, proper circulation and program placement aims to create synergies with the existing facilities. To avoid program isolation, for example, trade shops incorporate social spaces, study spaces and student amenities to attract students from other departments and disciplines. One site-specific sustainable design solution was to include sourcing wastewater heat from an adjacent water treatment plant for the inslab radiant heating system. 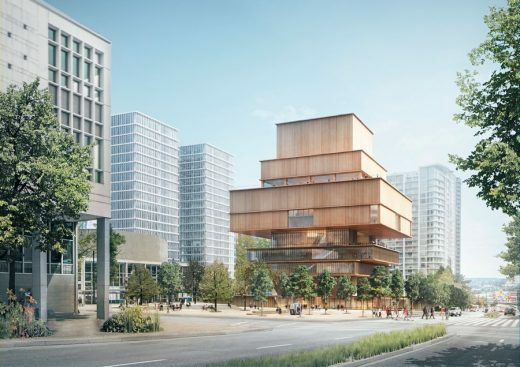 Critical to the success of these initiatives is maximizing the passive energy potential of the new addition by using principles of sustainable design to inform the orientation, footprint and massing. The design of the new addition integrates components for daylighting, natural ventilation and managing heat gain. The prominent use of wood, photovoltaic arrays and urban agriculture demonstrate Okanagan College’s commitment to sustainability. This building promotes the College as a forward-thinking institution and leader in green practices. 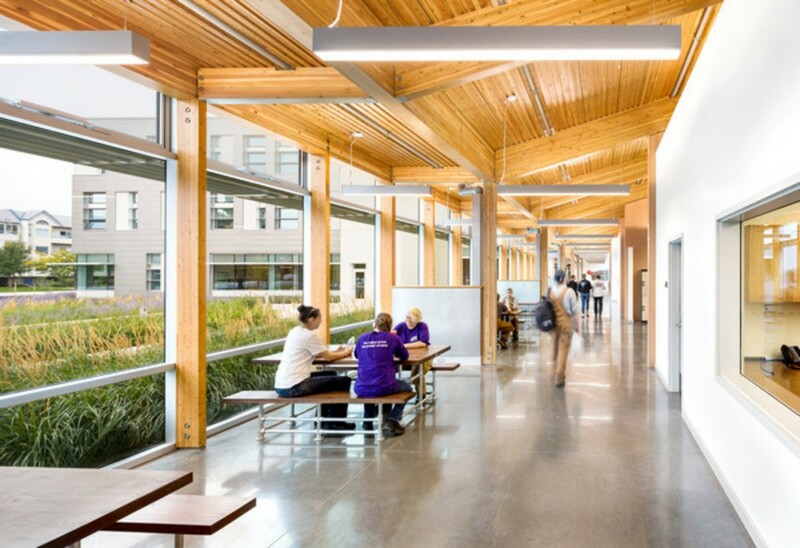 The wood-lined entrance canopy defines the triple-height atrium and adds warmth to the corridors and is a natural fit and symbol for the sustainable design strategy. It also showcases the structural timber products manufactured locally in the Okanagan Valley. Okanagan College sought to create a connection with its community. The three-storey addition is located much closer to the street and provides a new public face for the Trades Complex with the enhanced presence of the main entrance connecting with the community. The courtyard was configured around an existing 50-year-old copper beech tree, carefully preserved during construction. Retaining this local landmark was a key driver in laying out the new addition. Extensive new landscaping includes 25 percent of plantings that are crop-bearing edible varieties, which is another way this project engages with its community.